I’m sure in some capacity we have all heard of Left 4 Dead, the hectic co-op oriented zombie shooter developed by Valve South who would later go on to rebrand as Turtle Rock Studios. Left 4 Dead was a massive hit and led to Turtle Rock’s parent company of the time, Valve Corporation, to develop a sequel to the IP. This left Turtle Rock free to step out on as an independent studio and attempt to parlay their success into a spiritual successor that we know today as the ill-fated Evolve. Despite the massive pre-release buzz and positive reviews for Evolve, the player base just wasn’t there to support the online multiplayer centric title with E-Sports aspirations. Because of that, sales numbers were well below the average for a triple-A game. There were many factors gamers pointed out as the cause for the lacking player base, including a post-release support, a confusing DLC release schedule that wasn’t covered by the season pass, and a switch to free to play late in its life cycle that would inevitably be the final move before the publisher, 2K, fully halted support for the game. Altogether, it seemed as if Turtle Rock’s aspirations for a genre defining online shooter far outweighed their experience with sustaining a player base. With the announcement of the partnership, Turtle Rock also confirmed that they are currently in development of an entirely new IP. While Turtle Rock is still staying tight lipped on most of the details they have confirmed that it will be a free to play first person shooter with intense co-op elements. The new mystery game will be available on PC and consoles. 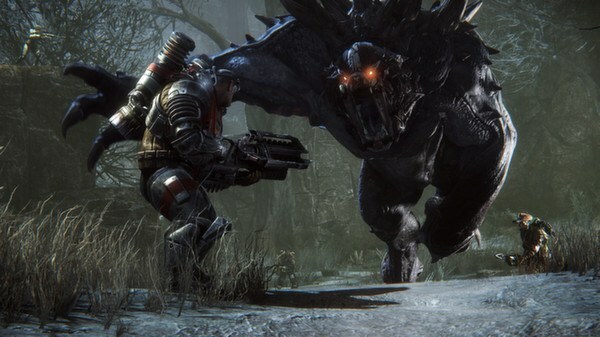 At launch, Evolve was a fun game that ultimately was held back by the studio’s inexperience with multiplayer communities. This partnership is outstanding in that Turtle Rock saw their flaws and admitted to them all for the betterment of their fans and players. It’s rare to see any person or company show humility, especially when it comes in the form off pointing out faults in something that they held in such high regard. Kudos to you, Turtle Rock.